Simon & Schuster, 9781476726250, 400pp. For most Americans, Creole cooking is permanently and exclusively linked to the city of New Orleans. But Creole food is more than the deep, rich flavors of Louisiana gumbo. In reality, its range encompasses foods spread across the Atlantic rim. From Haiti to Brazil to Barbados, Creole cooking is the original fusion food, where African and European and Caribbean cuisine came together in the Americas. 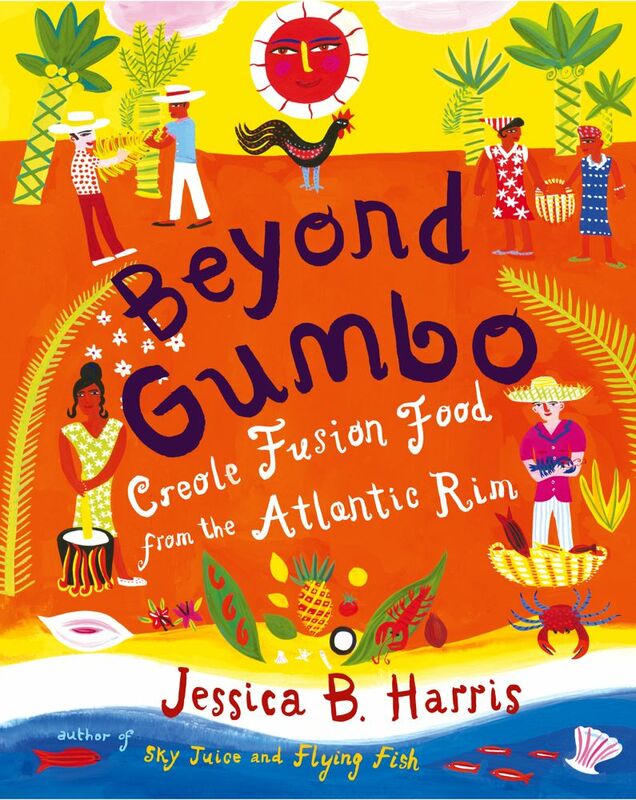 In "Beyond Gumbo, " culinary historian and critically acclaimed cookbook author Jessica B. Harris has brought together 150 of these vibrant recipes from across the Americas, accompanied by cultural and historical anecdotes and illustrated with beautiful antique postcards. Creole cuisine incorporates many elements, including composed rice dishes, abundant hot sauces, dumplings and fritters, and the abundant use of fresh vegetables and local seafood. In Creole cuisine you might find vanilla borrowed from the Mexican Aztecs combined with rice grown using African methods and cooked using European techniques to produce a rice pudding that is uniquely Creole. Harris uses ingredients available in most grocery stores and by mail order that will allow any home cook to re-create favorite dishes from numerous countries. From Puerto Rico's tangy "lechon asado" to Charleston's Red Rice, from Jamaica, New York, to Jamaica, West Indies, Harris discovers the secrets of this true fusion cuisine. Mouthwatering recipes such as Corn Stew from Costa Rica, Aztec Corn Soup from Mexico, Scallop "Cebiche" from Peru, Baxter's Road Fried Chicken from Barbados, Roast Leg of Pork from Puerto Rico, Mashed Sweet Potatoes with Pineapple from the United States, and six different gumbo recipes will lead you to the kitchen again and again. Sweets and confections are an essential part of Creole cooking, and Harris includes delectable dessert recipes such as Lemon-Pecan Pound Cake from the United States, Three-Milk Flan from Costa Rica, Rice Fritters from New Orleans, and Rum Sauce from Barbados. To complete the fusion experience, sample drink recipes such as Banana Punch from Barbados and Lemon Verbena Iced Tea from New Orleans. Tastes that are as bright as tropical sunshine are hallmarks of this international cooking of the Creole world. With a comprehensive glossary of ingredients and lists of mail-order sources, "Beyond Gumbo" will transport you to kitchens throughout the Americas and take you on a culinary journey to the roots of Creole cuisine. Charlayne Hunter-Gault author of In My Place The kind of culinary anthropology that helps us understand our world and its people on a level rarely offered, but sorely needed. A joy to have, even if you don't cook. Jasper White chef-owner of Summer Shack, and author of 50 Chowders A fascinating book, chock full of tantalizing ideas, recipes, and a unique historical viewpoint. Only Jessica, with her passion for people, travel, folkways, and times past, could have connected all the many dots to tell this story. Her recipes reflect the enduring spirit of the people who make Creole cooking so festive and delicious. Marcus Samuelsson chef-owner of Restaurant Aquavit Once again, Jessica Harris masters the ability to both educate and inspire the reader in a fascinating new way. I particularly enjoy her way of using culture and history to merge the three major cuisines in Beyond Gumbo. Norman Van Aken chef-owner of Norman's Jessica Harris illuminates the dark, mysterious, and must-be-learned lessons of African-Creole cooking. She belongs in the elite pantheon of writer-cooks alongside Elizabeth David, Elizabeth Lambert Ortiz, Craig Claiborne, and a handful of others. Too often people are seduced by touristy "Caribbean" food that lacks the soul and bone-deep honesty that have sprung from the people who have turned bitter fate into delicious love. Betty Fussell author of My Kitchen Wars Don't be fooled by the ease and grace with which Jessica Harris offers us a radically new culinary map. Wrapping anthropological history in the pleasures of anecdote and adventure, she looks beyond mapped geography to explore what happened "when Africa and Europe came together in the Americas" to produce the fused cuisine and culture we now call Creole. Places and people come alive in a rich medley of colorful, flavorful dialects and foods. Reading the recipes makes you want to dance as well as eat. John Martin Taylor owner of www.HoppinJohns.com Jessica Harris takes us on an erudite, mouthwatering tour of the African diaspora, with enchanting stories and straightforward recipes that illuminate the breadth of the Creole cooking of the African Atlantic. Alexander Smalls host, author, opera singer, and chef-restaurateur As butter is to bread, cream is to sugar, and brown pan gravy is to steamed buttered rice, Jessica Harris is the bowl that cradles and warms our gumbo. She has conjured up the souls of the ancestors and set the table with their most memorable recipes. Because of Jessica, if we want to, we can eat our way home again. If preparing these dishes doesn't have you dancing, then have a cup of Zazerac from Cuba, or Sazerac, as it's called in New Orleans, and you will. Your steps will be lighter, and your heart will overflow with love.